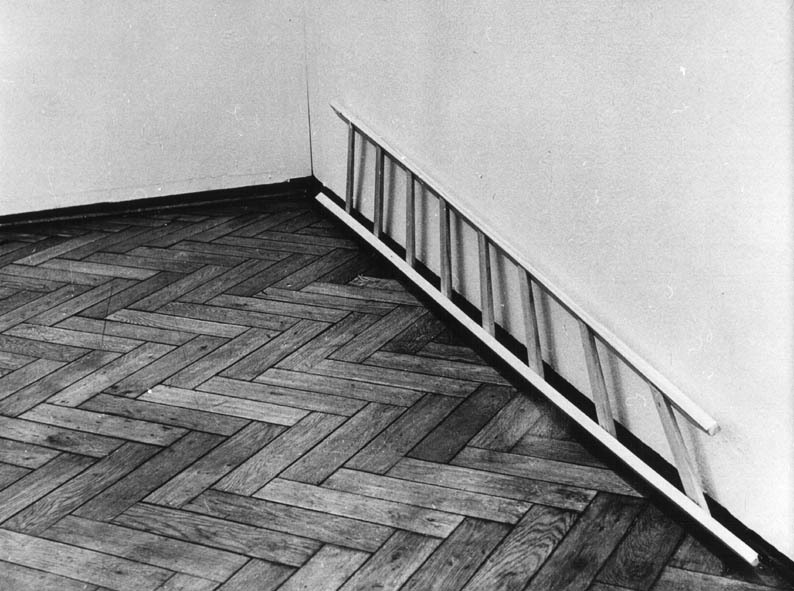 Born 1943 in Warsaw, visual artist working in photography and video art, art theoretician. Visual artist working in photography and video art, art theoretician. Elaborate designs for personal communication instruments and survival vehicles are central to Wodiczko's work, exploring social and political marginalisation through creating solutions for alienated and excluded communities to “develop their shattered abilities to communicate” and share their experiences with others. His artistic practice is an exercise in democracy, an attempt to poke at politics and social structures through unexpected and controversial art forms. Wodiczko works with projections, video and audio to create a platform in which the voices of those who have been pushed to the edges of society because of any series of traumatic events - homelessness, sickness, war and exile. These works often juxtapose jarring slogans on iconic buildings and monuments, distorting the accepted narrative of history and society in order to bring idiosyncracies to the surface and promote a more tolerant, peaceful approach to community on both a local and global level. In 1968 Krzysztof Wodiczko graduated from the Academy of Fine Arts (ASP) in the Industrial Design Department, Warsaw. Today he is considered among the internationally most acclaimed Polish artists. Having emigrated twice, from Poland to Canada and then from Canada to the United States, he divides his time between New York, where he lives and Cambridge, Massachusetts, where he is a Professor of Visual Arts, a head of Interrogative Design Group, and a director of the Center for Advanced Visual Studies at the Massachusetts Institute of Technology. 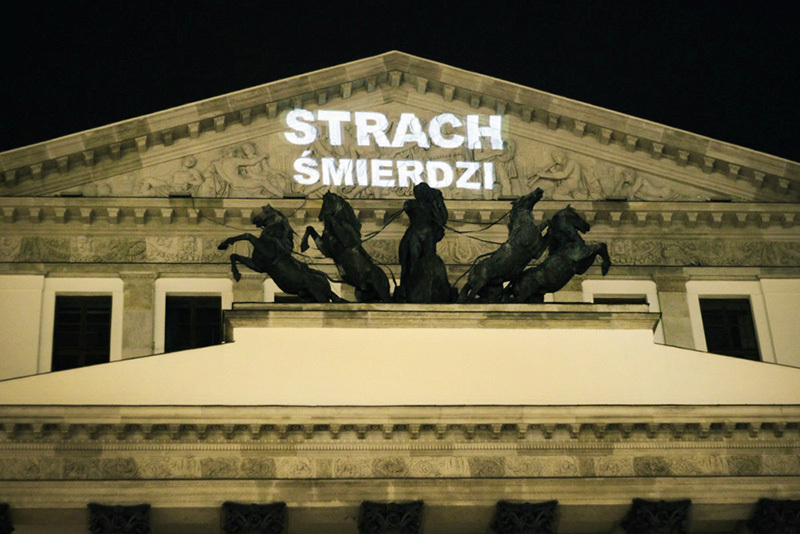 Since 1980, Krzysztof Wodiczko has created over 80 Public Projections of still and video images that critically animate historic monuments and public buildings. Public Projections with still images include: The Grand Army Plaza Memorial Arch, Brooklyn, NY (1983); The South African Embassy, London (1985); The Hirshhorn Museum, Washington D.C. (1988); The Whitney Museum of American Art, New York (1989), The Lenin Monument, Berlin (1990) and Arco de la Victoria, Madrid (1991). 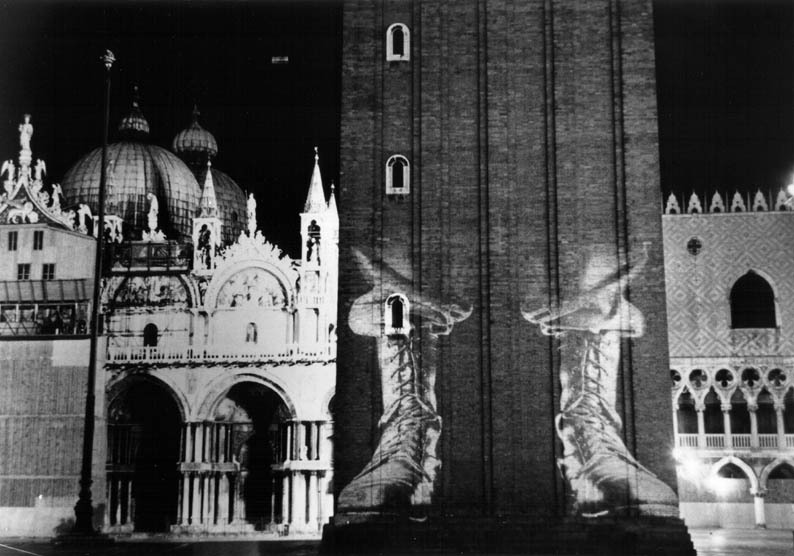 Public Projections involving sound and motion began with City Hall Tower, Kraków (1996) and later engaged the following monumental city symbolic structures: Bunker Hill Monument, Boston (1998); A-Bomb Dome, Hiroshima (1999); El Centro Cultural, Tijuana, Mexico (2001); facade of the National Gallery in Warsaw (2005) and the Kunstmuseum Basel, Switzerland (2006). In 2005 a major individual exhibition titled If You See Something... was held at the Galerie Lelong in New York. Projected onto the gallery walls were images of frosted windows, behind which people recounted and exchange various stories that each unfold as a compelling witness to the abuse of power. In one story, a young man being beaten by authorities, already defeated, does not protest; in another, family members of an accused terrorist plead for his release, claiming a forced confession. As the intensely emotional and vivid narratives inside the gallery space are juxtaposed with the ambiguous imagery of dark, moving figures behind the windows, blurred are the distinctions between 'us' and 'them', between what is assumed and what is real. 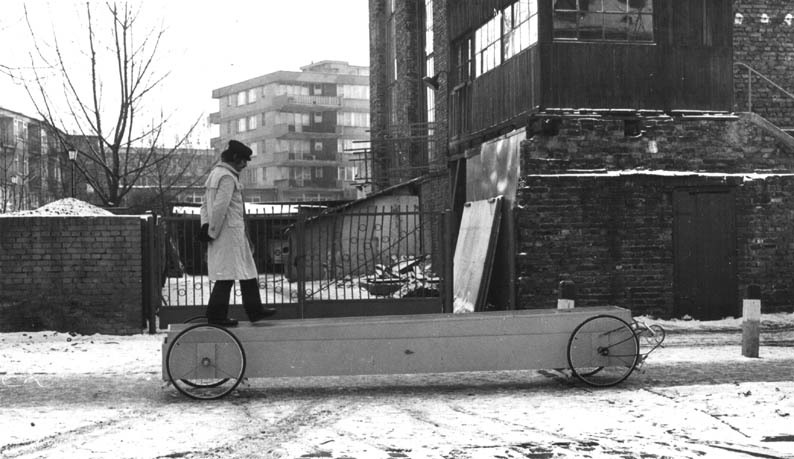 Wodiczko has also developed a series of tools and devices for urban interventions, such as Homeless Vehicle (1988-89), Poliscar (1991), as well as portable and wearable communication instrumentations such as Alien Staff (1992), Porte-Parole (1994), AEgis (2000) and Dis-Armor (1999-present). His Homeless Vehicles, upgraded models of a supermarket cart large enough to provide shelter, designed with elements resembling missile parts or spacecraft, are among of his most recognisable objects. For Wodiczko, the city's approach to the problem of homelessness made its victims exiles in their own city. The artist provides these exiled communities with tools for survival and for communication, encouraging them to make their voices heard and demand their rights. In 1998 Krzysztof Wodiczko received the 4th Hiroshima Art Prize 'for his contribution as an artist to the world peace' and in 2004 the Kepes Award, at MIT. In 2005 he received an annual award from the College Art Association for the 'distinguished body of artistic work'. In 2009 he was a guest at the 53rd Venice Biennale, filling the Polish Pavilion with his Guests project. Viewers watch scenes taking place seemingly outside, behind an illusion of windows, their projection on the pavilion's windowless walls. The individual projections, the images of windows projected onto the pavilion's architecture, open its interior to virtual, but at the same time real, scenes showing immigrants washing windows, taking a rest, talking, waiting for work, exchanging remarks about their tough existential situation, unemployment, problems getting their stay legalised. The slight blurriness of the images reduces the legibility of the scenes taking place behind milky glass. Wodiczko plays with the visibility of immigrants, people who are 'within arm's reach' and, at the same time, 'on the other side', referring us to their ambivalent status, their social invisibility. Both sides experience an inability to overcome the gap separating them. The Biennale visitors are 'guests' here too, of which they are reminded by the images of immigrants trying, from time to time, to peek inside. Krzysztof Wodiczko's War Veteran Projection is an audiovisual project carried out in various places around Warsaw using a demilitarised Honker Skorpion 3. The contraption projects statements issued by Polish war veterans from Iraq and Afghanistan which express the difficulties they face in returning to civilian life. The weapons platform at the back of the military vehicle, which was specially commissioned for the Polish armed forces in Iraq and Afghanistan, has been replaced with a specially designed 'projection platform' fitted with audiovisual equipment that emits voice sounds and textual images. The texts, projected on the walls of Warsaw buildings, speak about the issues faced by Polish war veterans and their families. The projection was preceded by a workshop during which interviews with the veterans were recorded. Selected fragments, approved by the participants, have been turned into an audiovisual projection using special computer software. In autumn 2011, London's Work Gallery hosted a show of Wodiczko's works, titled The Abolition Of War. 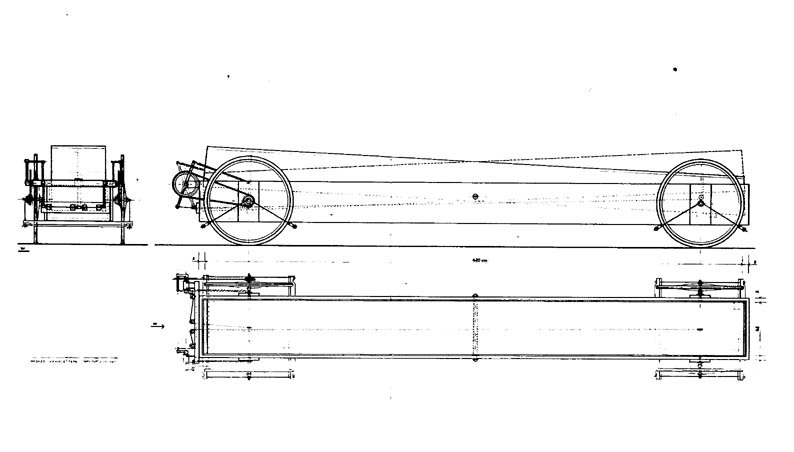 The title is drawn from Wodiczko’s proposal to radically transform the Arc de Triomphe de L’Etoile into the structural centrepiece of the Arc de Triomphe - World Institute for the Abolition of War, thus reframing the traditional war monument as a site of education, critical discourse and proactive work towards peace. The show presented a range of the artist's projects and projections in the public space. In 2012 he collaborated with Argentinean architect Julian Bonder on the museum celebrating the abolition of slavery in Nantes. It was created to recognise a dark period in the history of France and to commemorate the abolition of slavery by the French State in a fitting and solemn manner. The memorial also holds out a beacon to the future aiming to promote exchanges, in a balanced and fair way at a site that was France's most important slavery port between the 15th and 19th centuries. It was meant as a 'metaphorical and emotional rendering of the principally historical, yet still relevant fight for the abolition of slavery [that bares] the memory of the past [and serves] as a warning for the future'. 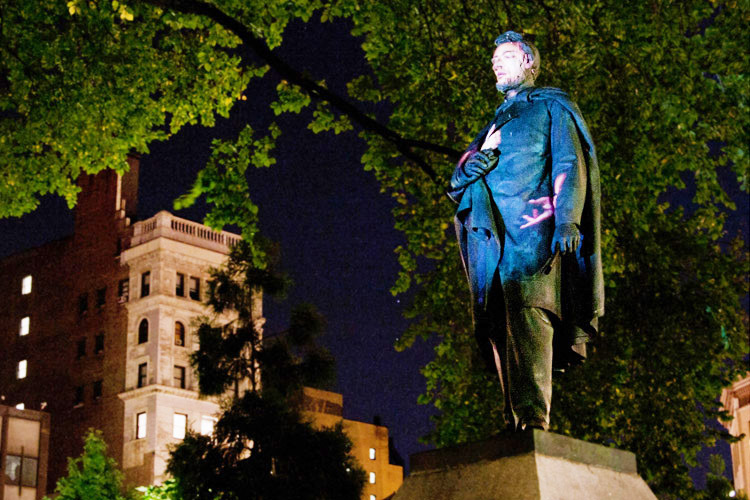 In November 2012 he set up another chapter in the War Veteran series with a projection of authentic interviews with war veterans on the monument to Abraham Lincoln in New York's Union Square Park. 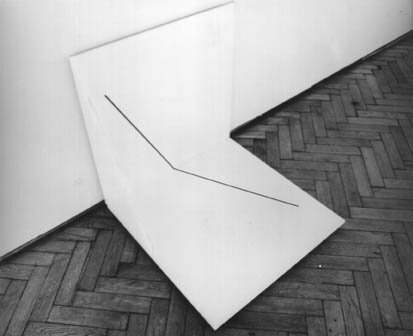 Wodiczko's work can be found in numerous public collections such as: The Fundació Tapies, Barcelona, Spain; Museum Sztuki, Łódź, Poland; The Museum of Contemporary Art, San Diego; The National Gallery of Canada, Ottawa; the Artbank, Canada; the Israel Museum, Jerusalem; the Museum of Contemporary Art, Lyon, France; FNAC, and FNAC Ile de France, Paris; FRAC Pays de la Loire, Nantes, France; The National Museum of Modern Art, Kyoto; The Jewish Museum, New York; The Walker Art Center, Minneapolis; The Hiroshima City Museum of Contemporary Art; The Center for Contemporary Art, Warsaw; The New Museum of Contemporary Art, New York; Zachęta National Gallery of Art, Warsaw; MACBA, Museum of Contemporary Art in Barcelona, and Kunstmuseum Basel, Switzerland. Based on information provided by the artist, May 2007. Updated November 2012 by Agnieszka Le Nart.